It was 17 degrees when I left the house. Winds were calm. I left late and sunlight was upon me. After two days, I have the clothing aspect down. Same as yesterday but today I swapped two layered mountain bike shorts for underpants and tights. Also, I swapped to my new Performance rain pants from my Marmot Precip pants. The former is cut for cycling and has thinner material. Perfect. After my usual 10-minute warm up, I was cooking with gas (nods to my college friend Susan who used to say this all the time back in the day). I stopped at Dyke Marsh as usual, this time where the stream cuts through to the river. Ice and sunrise. Pretty stuff. The boards of the Dyke Marsh bridge were cover with a crunchy frost which was surprisingly grippy, another benefit of 17 degree weather. I cruised through Old Town without a care and made it across the two long wooden bridges to the north without slipping. Oncoming bike riders looked pretty tense but I just laid off the brakes and tried to minimize leaning. How nice it was to break free of the tree cover and not be smacked in the face by a headwind. The ride home was another day in the park. It was actually above freezing but I didn’t notice. It felt no different from the morning. The geese apparently disagreed. They were having a party in the river. The rest of the ride home was dark. Unlike dying people, I went toward the white light. Somewhere along the way I passed 100 miles for the year. Woot. No bike commute tomorrow. I’m going to a high school basketball game after work. 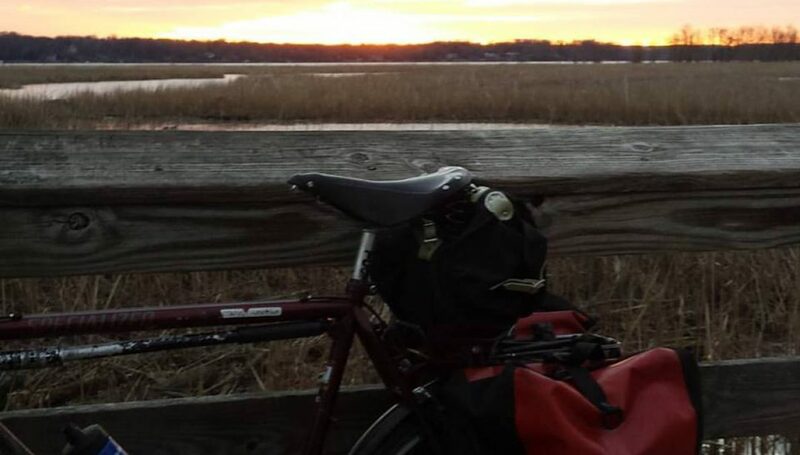 Posted on January 6, 2016 by rootchopperPosted in "Mount Vernon Trail", #bikedc, #bikeva, bike commute, Dyke Marsh, sunrise, winterTagged "Mount Vernon Trail", #bikedc, #bikeva, bike commute, winter. One of my favorite things while winter bike commuting was riding by a tough looking guy coming outside his house to warm up his truck. I got a lot of double takes. 17 degrees, never again! I’m impressed that you keep doing it. I went on my porch yesterday morning to assess my commuting outfit for a high of 60, low of 55 and was shocked that I lived anywhere else. How did I bike commute in Pittsburgh? UGH! Nice work John! It was 36 degrees this morning. I drove. I have this all backwards,. I think.